Featured on: Featured on Planetary Radio, hosted by Mat Kaplan, produced by Bill Nye's Planetary Society. What if the Soviets won the Space Race? 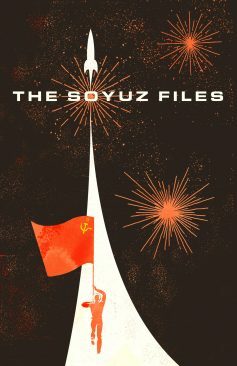 The Soyuz Files is a six-part radio play podcast set in an alternate history. The Soviet Union lands on the moon first, kickstarting a mad rush to uncover the conspiracies surrounding the event before an embarrassed United States escalates the Cold War into a world war. Breaking news! The United States has lost the Space Race to the Soviet Union. On October 31, 1968, Americans received transmissions from Cosmonauts on the Lunar surface. Jack Schechter, host of WNYX’s news program The Friday Review, speaks with Natalia Gromyko, Soviet diplomat, to discuss what this means for geopolitics and the future of the Cold War. The Cosmonauts who landed on the Moon finish their world tour with a White House dinner. On the other side of the Iron Curtain, a Soviet rocket scientist named Nikolai has been sending postcards to Jacob, an American working at NASA. He brings the postcards to Jack at The Friday Review to find out why Nikolai has disappeared. Jack seeks Natalia’s help in locating Nikolai, but she has a word of warning to share with the idealistic journalist. Meanwhile, in the midst of the dismantling of NASA’s Apollo Program, the Nixon administration doubles down on defense. Broadcast from the snowy streets of Moscow, Jack teams up with Soviet reporter Igor to try and locate Nikolai. What they find instead is even more troubling: a ransacked home, Moscow police hot on their tail, and a deepening of Cold War paranoia. “Diogenes will know.” “Not enough.” The cryptic notes Nikolai left in the margin of a top secret document take Jack from Moscow to the Cosmodrome itself, halfway across the continent, to investigate the Soviet Space Program from within. Four months after the world learned the truth of the Soviet Moon landing, Jack returned to The Friday Review following his leave of absence to file one last report amid growing global conflict.